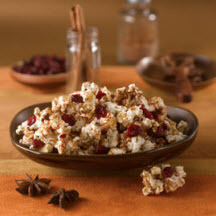 A cinnamon-spiced brown sugar syrup coats this dried cranberry studded popcorn snack mix. Combine brown sugar, corn syrup, spices, and margarine in microwave-safe bowl; cook on High heat for 2 1/2 minutes until bubbly hot. Add Craisins® to popcorn; toss with hot sugar mixture until well coated. Cool mixture before serving or store in airtight container. Craisins® is a registered trademark of Ocean Spray Cranberries, Inc.